It almost looks like this Great Blue Skimmer dragonfly (Libellula vibrans) was wearing cool wraparound sunglasses this past weekend when I spotted him chilling out at Occoquan Bay National Wildlife Refuge. 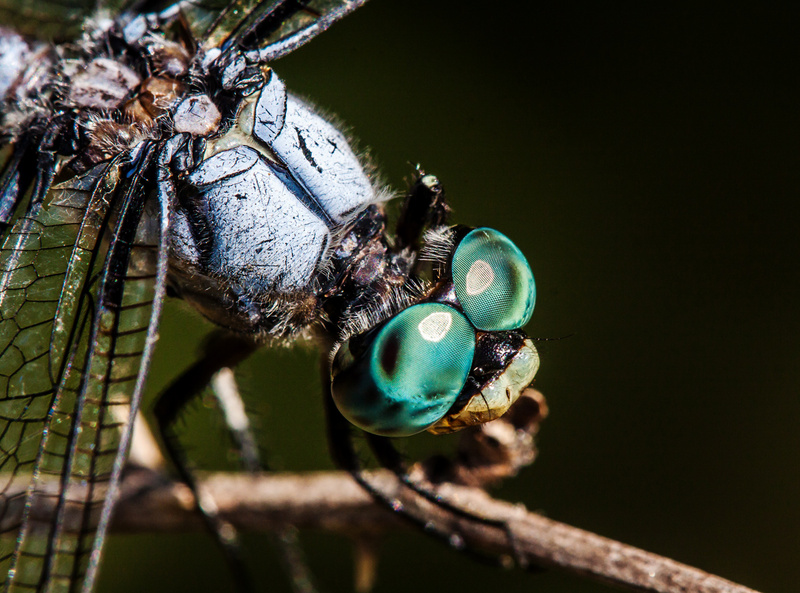 From a distance, it looks like dragonflies have smooth bodies, but when you get a good look up close, you discover that they have tiny hairs covering various parts of their bodies. Stunning image Mike well caught, great macro. Insects are amazing. I’m guessing it all serves a purpose. I hope you’re enjoying the long weekend Mike. Some of them look like monsters a child might draw! Weird that blue armor! As Benjamin is all about the details, this photo will provide endless exploration and delight! In truth, I was quite intrigued by the enlarged photo. You have given the opportunity to see what the eye misses, amazing! Thank-you, Mr. Mike!! Wow, Mike! What an amazing photo, capturing all that texture and detail. Thanks, Laura. My macro lens lets me see the world in a whole different perspective, a perspective that I really love. Nice Mike! The details are Amazing when you get that close! Thanks, Reed. It’s not too often that a dragonfly lets me get that close, but I try to take advantage of it when I can. Thanks, Eliza. It’s a challenge to get close enough and stay steady enough to get a shot like that one, but the results are really cool when I manage to do so. That is really cool ! !